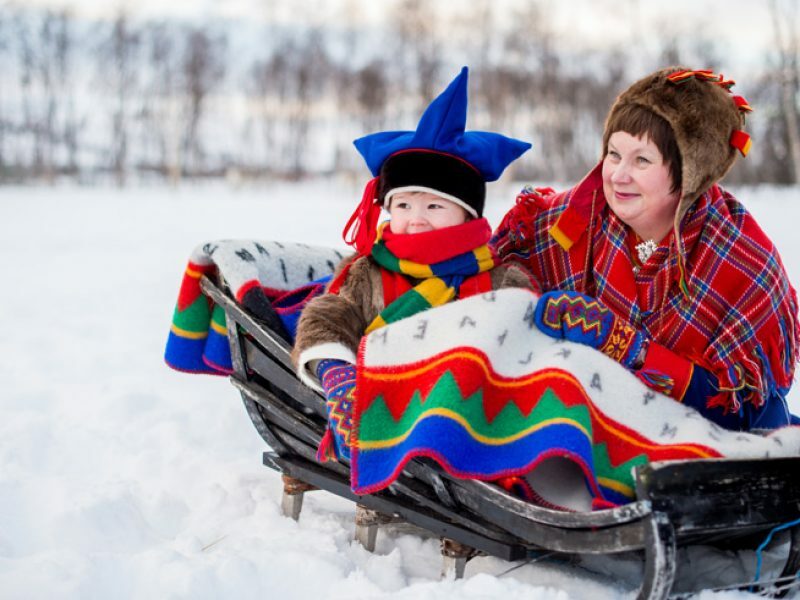 The Sami that we met on this fascinating trip live in a progressive society and are – unusually – allowed to mix with Norwegians and be educated with them. The eldest sister in the family we met – Ann-Margaret – was a young mother, while her younger sister was planning to attend university. Ann-Margaret told the group of the difficulties in putting a Sami child into early education in Norway as there is no primary school tailored to Sami traditions. The Norwegian government used to discourage the Sami culture but have since made special provisions, such as allowing only the Sami to herd reindeer in their native areas, and establishing a Sami National Day on February 6th. Due to the nature of the climate in Norway, the Sami herds are semi-nomadic and follow the seasons as part of reindeer husbandry. The summer months can attract insects which prey on the animals, and as a result the Sami work at higher altitudes during these months to avoid irritation to their livestock. Ann-Margaret told us a story of a school visit to Russia, on which she was trying to buy a Sami souvenir but couldn’t communicate in Russian or English to the lady selling. They then both started taking in Sami language and, although the conversation was not totally fluent, they found that they could understand each other. Whilst we were visiting the Sami camp we had the opportunity to hear the beautiful sound of Yoiking from another young Sami woman who was one of the hosts for the evening. She explained that Yoiking is the traditional Sami means of song, a form of expression used to articulate emotions about families or natural occurrences which is part of an oral tradition passed down through generations. Margaret-Ann prepared to sing about one of her cousins, and described how she would scroll through her mental file of yoiks as if she were “visiting the library”. She knew numerous yoiks about her family members and abstract forms such as the wind or the sky by heart. The sound is Nordic soul music and its influence can be found in music from the southern United States such as folk and country music.The sound is hard to describe and the name Yoiking makes it sound ugly, but in fact it is very soulful and therapeutic for the Yoiker and the listener. Read more about the attractions of Northern Norway, and find out about our range of summer and winter holidays in Swedish, Finnish and Norwegian Lapland here.